Abstract. A continuous 305-year (1711–2016) monthly rainfall series (IoI_1711) is created for the Island of Ireland. The post 1850 series draws on an existing quality assured rainfall network for Ireland, while pre-1850 values come from instrumental and documentary series compiled, but not published by the UK Met Office. The series is evaluated by comparison with independent long-term observations and reconstructions of precipitation, temperature and circulation indices from across the British–Irish Isles. Strong decadal consistency of IoI_1711 with other long-term observations is evident throughout the annual, boreal spring and autumn series. Annually, the most recent decade (2006–2015) is found to be the wettest in over 300 years. The winter series is probably too dry between the 1740s and 1780s, but strong consistency with other long-term observations strengthens confidence from 1790 onwards. The IoI_1711 series has remarkably wet winters during the 1730s, concurrent with a period of strong westerly airflow, glacial advance throughout Scandinavia and near unprecedented warmth in the Central England Temperature record – all consistent with a strongly positive phase of the North Atlantic Oscillation. Unusually wet summers occurred in the 1750s, consistent with proxy (tree-ring) reconstructions of summer precipitation in the region. Our analysis shows that inter-decadal variability of precipitation is much larger than previously thought, while relationships with key modes of climate variability are time-variant. 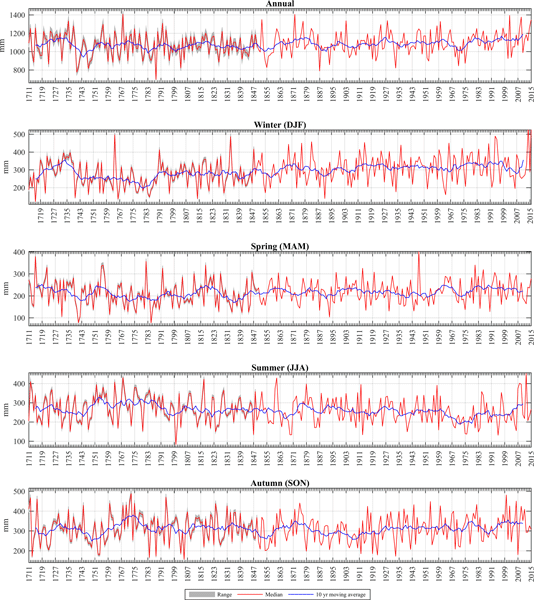 The IoI_1711 series reveals statistically significant multi-centennial trends in winter (increasing) and summer (decreasing) seasonal precipitation. However, given uncertainties in the early winter record, the former finding should be regarded as tentative. The derived record, one of the longest continuous series in Europe, offers valuable insights for understanding multi-decadal and centennial rainfall variability in Ireland, and provides a firm basis for benchmarking other long-term records and reconstructions of past climate. Correlation of Irish rainfall with other parts of Europe increases the utility of the series for understanding historical climate in further regions. How to cite: Murphy, C., Broderick, C., Burt, T. P., Curley, M., Duffy, C., Hall, J., Harrigan, S., Matthews, T. K. R., Macdonald, N., McCarthy, G., McCarthy, M. P., Mullan, D., Noone, S., Osborn, T. J., Ryan, C., Sweeney, J., Thorne, P. W., Walsh, S., and Wilby, R. L.: A 305-year continuous monthly rainfall series for the island of Ireland (1711–2016), Clim. Past, 14, 413-440, https://doi.org/10.5194/cp-14-413-2018, 2018. 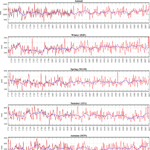 This work reconstructs a continuous 305-year rainfall record for Ireland. The series reveals remarkable variability in decadal rainfall – far in excess of the typical period of digitised data. Notably, the series sheds light on exceptionally wet winters in the 1730s and wet summers in the 1750s. The derived record, one of the longest continuous series in Europe, offers a firm basis for benchmarking other long-term records and reconstructions of past climate both locally and across Europe.